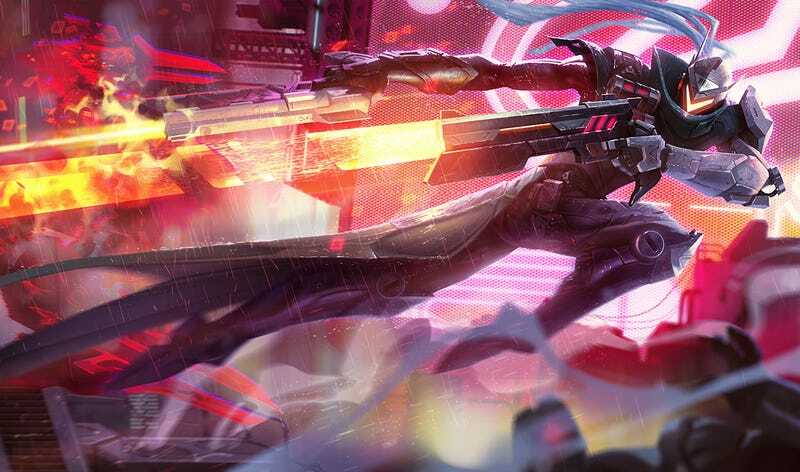 One of the most popular skins last year in League of Legends was PROJECT: Yasuo, a special outfit that made the samurai warrior look like an extra from Metal Gear Rising: Revengeance. Shocking as it might sound, Riot saw how much fans liked this new robo-Yasuo and decided to make five more PROJECT skins this year. The new skins, which will be released during the 5.17 patch that goes live this week, allow you to (potentially) assemble an entire futuristic-robot-ninja-looking team. And based on the screenshots that’ve been meticulously assembled by the popular League of Legends news site Surrender at 20, that team would look pretty darn cool. Zed the ninja, who now looks like a...robotic bird of some sort? I swear that I’ve played a game with this guy in it before. Man. Why do all these things have to cost so much friggin’ money? I’m going to be so very broke so very soon.